Seatbelts when working properly are one of the most important safety devices ever introduced into a vehicle. It is hard to even imagine that most cars before the late 1960’s did not come equipped with a seatbelt. When working as designed, modern day seat belts are life savers. However, when a seat belt is defective or the seatbelt fails, then serious injury and even death can occur. In the early days of seatbelts, many cars only had lap belts in the front seats which safety experts soon realized that many occupants were having spinal cord injuries in frontal collisions when the upper torso would accelerate and jack-knife striking the solid dash or roof pillar. Then later shoulder belts were added and finally after 40 years of improvements, the 3-point belt system that is in most modern vehicles. The seatbelt fails to properly hold the occupant secure in their seat and prevent the occupant from being thrown around like a rag-doll. Failures are especially dangerous in high speed crashes and rollover accidents. In a rollover, if the person is able to move in their belts too freely, then they may strike the roof of the vehicle in a rollover or not be secured snug or low enough into the seat to prevent the roof from crushing into their head. Seatbelts can also release under pressure when the person needs its protection the most. If an unlatching or unbuckling happened in a rollover, then the occupant can be ejected, partially ejected and be crushed by the roof collapse. In an auto accident, the un-buckled occupant can be thrown into the crash, into a roof column or roof pillar, dashboard or into the rigid part of the seat in front of them. Nothing good happens in a crash with an un-belted passenger! Some seat belt can fail to lock and allow spool-out, endangering the passenger to severe and fatal head strikes. Seat belt retractor failures like all seatbelt failure demand an experienced team of lawyers and engineers to help prove the defect. Some seat belts are improperly designed and the push buttons are too tall, allowing for accidental engagement during a crash or rollover. Some seat belts do not properly adjust to the heights and sizes of the occupants, thus not holding certain sized occupants in safely. In most auto wrecks the crash between the two vehicles is the first collision that occurs, then next one or the second collision happens a micro-second later when the occupants strike or impact the seatbelt to help ride down the energy, hit the airbag or strike the interior of the vehicle, windshield, steering wheel the door from a side-impact or the roof in a rollover. The more secure a seatbelt fits and the more snug the occupant is in their safety zone, then less the chance of a severe second collision of the person. If any of the above seatbelt failures occur during the crash or rollover accident, then the second collision can be fatal. A working seatbelt is essential; for the rest of the safety systems to work correctly and to prevent excessive movement and acceleration during that second impact. An occupant without a working seatbelt system can also be seriously injured by the airbag that is designed to save lives. If not belted, the force of an exploding airbag alone can kill. Over-powered or excessive powered airbags can also kill. See more about defective and recalled airbags. If you or a loved one has been injured or a loved one killed in a rollover accident or auto collision and you suspect that the seat belt failed, call us and let us help find you the answers. 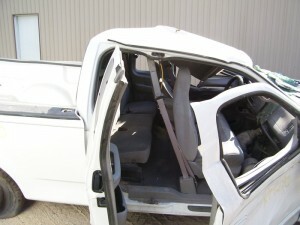 Seatbelt failures often go undiscovered until its too late and after the vehicle has been salvaged and crushed. Let our law firm help find the vehicle and preserve it for evidence in a product liability defect case. Please contact us today by calling 800-883-9858.